The botanical garden at the National Autonomous University of Mexico (UNAM) aims to preserve living collections of native species from across Mexico. Its setting in lava outcroppings removed from the busy metropolis of Mexico City makes an interesting, beautiful landscape. The site is ideal growing conditions with mild weather and plenty of rain through the summer. As well as the excellent collection of plants, the garden also has been decorate with a series of tiles painted with the wife variety of butterflies that visit the garden. The floating gardens are set along canals and lagoons throughout Xochimilco. The more traditional part of these gardens is located in the central part of the town while the newer, ecologicalpark is to the north of the town. Excellent for birdwatching, especially bulrushes, ducks, herons and egrets. The more touristy canals are the best places to get the full effect of these gardens as there are plenty of the gndola type boats needed for visitng these gardens. European guidebooks from the 1920s called these Floating Gardns the Venice of Mexico and UNESCO has declared Xochimilco a Cultural Heritage site in 1987. This garden is listed with the Mexican Botanical Gardens Association AMJB. Cuernavaca is known as the City of Eternal Spring because of the temperate climate and plenty of rainfall the city has beautiful flowers al the time. The garden includes the Museum of Traditional Medicine and Herbolarium, dedicated to the preservation of and study of plants native to Mexico. Of equal importance is the collection of wild Mexican orchids. Many of these orchids are endangered. Another important area is the collection of xerophytes, or plants that live with limited water, such as cacti, including many rare specimens. Considered by many to be the most interesting botanical garden in Mexico, this beautiful garden has plants collected from across Oaxaca, many salvaged during the building of new roads. This garden is as impressive for its collection of plants from around the world as it is for the space in which they grow. The 5,000 square meters was once the Toluca Market but the walls have since been made of 3,000 square meters of stained glass, including 28 colours and is considered one of the largest artworks in the world. Sunlight shines through the coloured glass across the exotic plants dropping dappled colours throughout the garden. Oliverio Jimenez, the director if the garden, says ‘the combination of plants and the stained glass is unique in the world.’ Added to these are the scent of the lush plants, the sounds of water from the fountains and classical music piped throughout the garden making the experience a relaxing sensation for many senses. Toluca’s temperate climate turns cold in the winter, but the microclimate created inside these stained glass walls allow tropical plants to survive. 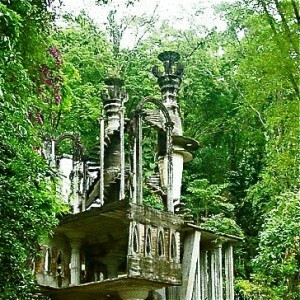 Las Pozas, Xilitla is the remarkable, fantastical creation of the English poet and artist, Edward James. As patron of the Surrealist movement James was influenced by the architectural elements of the surrealists as well as by the nature around him. Many of the concrete scuptures that define the landscape of this garden look like trailing orchids or resemble the intricate patterns of the jungle greenery. In the 1960s and 1970s Edward spent millions of dollars the gardens, employing hundreds of masons, artisans, and local craftsmen to build 36 concrete sculptures, across more than 20 acres of the Mexican jungle. Las Pozas has become well known throughout the world and has become a destination for artists, writers, tourists and photographers interested in Edward James and the Surrealist movement, but for people who have no knowledge of either the creater or the Surrealists, the gardens remain a place of magical beauty.